Salty, acidic and sour, the wrinkly little Japanese preserved plums called 'umeboshi' are known for their ability to cure hangovers and preserve youth. You're welcome. This past Fall I had the most wonderful week at The Awaiting Table cooking school in lovely Lecce, Italy, a small baroque city located in Puglia - the heel of Italy’s ‘boot.’ I had never traveled to this part of Italy before, so was excited to learn about a new region, and not quite sure what to expect. I flew into Rome and took an easy 5+ hour, smooth and scenic train ride to Lecce. The train station in Lecce is small and simple to navigate – a tiny taxi was waiting just outside the station (although the kind folks at the school will be delighted to pick you up if you prefer). A few minutes later, the taxi pulled into the walled city and I had to catch my breath. Lecce is remarkably beautiful and built from the most gorgeous golden yellow stone. It literally glows. That first evening our group met in the piazza and Silvestro Silvestori, the school’s owner and director, met us there and guided us through winding stone streets a short distance to The Awaiting Table. Large wooden doors swung open to reveal an interior courtyard (where Silvestro’s adorable vintage Fiat 500 lives). Just one more set of doors and The Awaiting Table greets you. I really don’t have the words to describe how welcoming, charming, quirky, vibrant, cozy and wonderful this place is. It is not set up like a formal, antiseptic school at all, but is truly a well-lived-in and well-loved home. You will feel as if you are gaining a rare and unique glimpse into real culinary life here, rather than being ‘taught’ classroom style – although you will likely learn more than you ever could in a traditional setting. Our first dinner was waiting for us in the school’s kitchen. A former stable, the kitchen was a delightful sight to behold. Complete with dried herbs on lines criss-crossing the ceiling, brightly colored walls adorned with vintage photographs and prints, uneven stone floors (ladies, don’t bring heels! 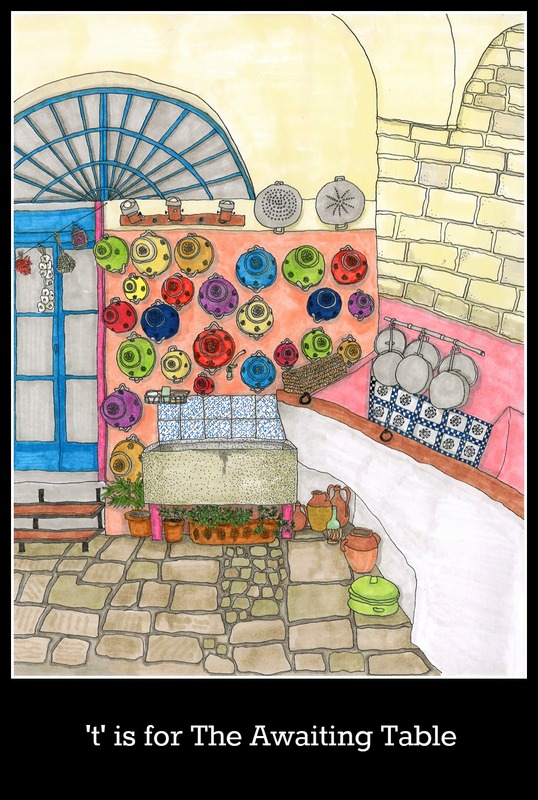 ), intricate tiles, a wall full of colorful colanders, beautiful windows, tall wooden doors - rustic, but with every imaginable convenience. I've attempted to capture part of it in the drawing above. The kitchen was dimly lit by an array of glittering candles and we set about getting know the cuisine and wine of Puglia, and each other. Each morning began at 10:00 a.m. with coffee in Antonio’s shop – the sweetest man in the world – then we were off to the market to gather the ingredients for the day’s lunch. Silvestro and the kind folks at the market (actually market(s)) guided us through the local ingredients – their history, lore, uses, etc. – and we left with overflowing bags in tow and smiles on our faces, and headed back to the kitchen to prepare our lunch. We were provided with a leisurely break in the afternoon, then back to the school at 6:00 p.m. to prepare dinner for the evening. Dinners were long and lovely. The wine flowed, and we left satisfied, happy, and proud of our accomplishments. The week was punctuated by an intimate tour of the city with the amazingly brilliant Simona, and a trip to the lovely seaside city of Otranto. The pace was pitch-perfect and I’m amazed at how much I learned. I am now confidently able to make my own pasta (a variety of shapes, but most notably the region’s signature shape, orecchiette), whittle and prepare whole artichokes, de-beard fresh mussels, clean squid, whip up a seafood soup, and make my own sausage. It’s true! I’ve been to many cooking courses and have come home feeling a bit wobbly on executing the dishes own my own – constantly referring to recipes and fumbling with notes, almost certain I’d forgotten something. Perhaps it’s the true experience – the market, the instruction, the doing, the camaraderie – that makes replicating the dishes at home seem effortless - like second nature. Silvestro is wonderful; passionate and knowledgeable about all culinary-things-Puglia (with a wry sense of humor) and is a sommelier to boot, so can provide true enlightenment as it relates to the regional cuisine and wines. The staff at the school is beyond awesome. Giorgio, the school’s administrator, is energetic, fun and delightful and will help you with anything (I mean anything!) you need in terms of logistics or assistance and can make miracles happen immediately. Need to change your train? Done! Need help with your hotel? Done! Need to make a copy of something? Done! Giuseppe helps Silvestro in the kitchen and will be with you every step of the way for the week. He is so dear - kind, patient, warm and is a wonderful teacher in his own right. There is no better person to have at your side for the week – we all loved him so much. And Anna silently and skillfully goes about whisking away dishes, pots, pans and plates so that you feel as if kitchen angels are afoot. On top of the amazing knowledge you will gain about the region, the city, and its cuisine, the week is filled with a special joy and warmth that is truly unique. By day two, you will feel as if you are cooking alongside true friends. It’s so rare these days to have the chance to really spend quality time with people; breaking bread together; laughing, learning, and becoming close. Those of us who attended have stayed connected via social media and are already planning our next visit (castle course, here we come!). I know we will all stay in touch and remain friends forever. If you ever have the opportunity to visit The Awaiting Table, I can’t recommend it highly enough. It’s perfect and beautiful and you will absolutely love it there. Greetings! It's been a bit quiet over here lately, but only because I've been working on a very special project! 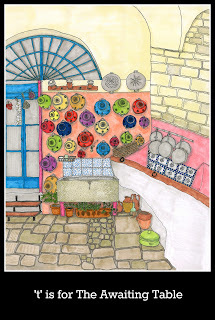 The Awaiting Table, a beautiful little cooking school in Lecce, Italy (way down south in the heel of the boot), asked me to provide some illustrations for their new website, which you can visit here, here, and here. The illustrations appear at the top and bottom of each page. I'm so happy and honored to have been a part of the project. Next week I am going for a visit and am just a tiny bit excited. I will tell you all about it when I return. Ciao! Salt made from the sea or land has been produced for thousands of years, and the world's regional cuisines have developed in harmony with the availability and nature of locally produced salts. Not for the faint of heart, salt making in days of old was difficult, demanding, and dangerous work. People continually took on the challenge, however, since salt was considered, literally, a treasure. The salts produced as a result embodied the unique character of their particular regions. Over the years, salt became vitally important - for feeding people and animals; curing and preserving foods; producing chemicals, dyes, and medicines; and tanning hides. Since access to salt was necessary for survival, it localized people. Salt was traded, taxed and often directly exchanged as currency. Salt created prosperity for nations, becoming both a means to achieving power and a physical symbol of it. Far from its days as a sought-after regal treasure, salt had become...commonplace. Housed in small cardboard boxes on the bottom shelves of brightly lit supermarket aisles, consumers not only devalued salt, but didn't really give it much thought at all. A sad story, true, but there is reason for hope. In recent years, consumer values around food - seeking local and sustainable sources, making organic choices, and favoring whole foods over packaged foods - have begun to shift the focus from industrialized salt to artisan salts once again. Hooray! Jacksonville residents are fortunate enough to have a wonderful local resource for all things salt. 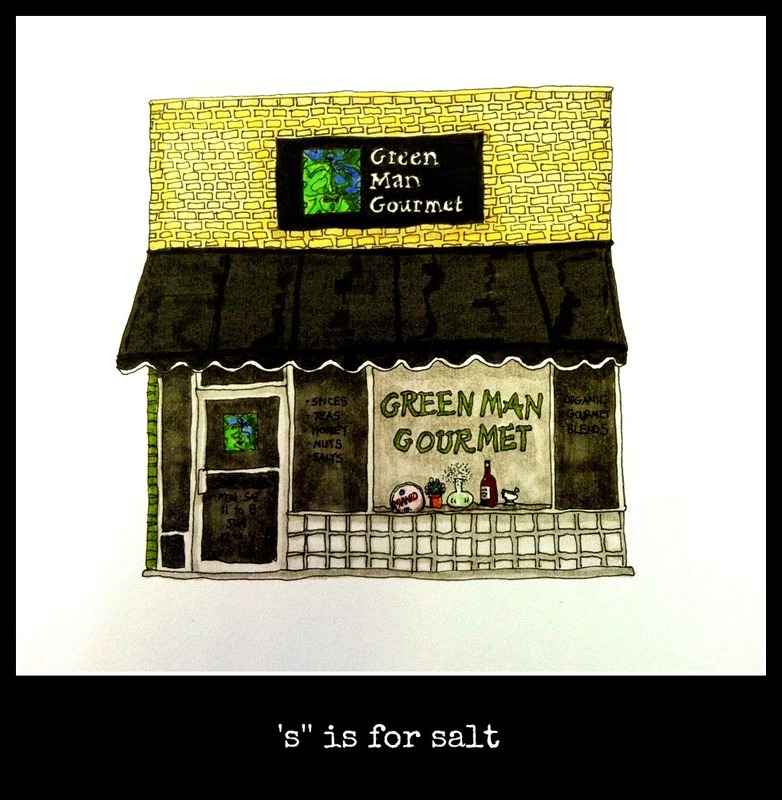 Meet Pete Eldridge from The Green Man Gourmet located in the lovely, historic neighborhood of Avondale. Pete and his business partner Dave Hart carry 24 varieties of salt, over 100 different herbs and spices, and a vast array of other culinary delights like coffee, honey, cheese, oils, vinegars, teas, and organic wine. Pete spent most of his career working in Laser Electro Optic Technology (yes, that's a real thing), and Dave was a teacher. 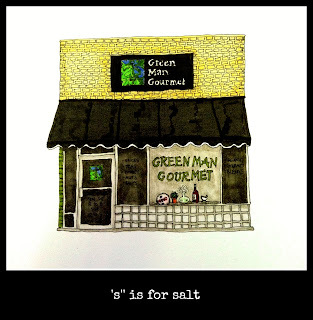 Longtime friends who had become a bit weary from their chosen professions, they crafted the concept for The Green Man Gourmet, which was born in 2010. I recently spent some time with Pete, who is beyond delightful, and as enthusiastic and passionate about salt, spices, and all things culinary as he can be. He explained that the shop sells salts within two broad, major categories - 'wet salts,' and 'flake salts.' "Most chefs use wet salts when cooking," he said, "as most cooking involves ingredients with some degree of moisture in them. When something dry (dry salt, for example) is combined with something wet, a shock happens, which results in a quick temporary flavor boost that dissipates quickly. If something wet is added to something wet, there is no such shock, and the dissipation rate is slower. That's why you will see restaurant servers coming to the table with pepper mills, but not salt mills," he said, "food the chef prepared using wet salt should be salted perfectly." Fleur de Sel, French Grey, and Japanese Aguni are wet salts. Flake salts are considered finishing salts because they are too light to be used in cooking; they include Murray River from Australia, and Cyprus Black Lava, which dissolves quickly when put onto something warm, like a baked potato, which creates nifty black 'lava-like' veins (hence the name). The shop offers a wonderful array of these salts like Chardonnay Oak Salt, aged in oak chardonnay wine barrels, which are then smashed and burned to smoke the salt. (I know!) The White or Black Truffle Sea Salts are knee-weakeningly good on popcorn, or almost anything really. The Lime Fresco Sea Salt can be used to rim a cocktail glass. And the Himalayan Salt Slabs are beautiful, pink, quartz-like slabs of salt, hand cut from deep in the Himalayan mountains. A microplane can be used to grate salt directly from the slab, or the whole thing can be refrigerated and used as a serving platter for fruits, sushi, vegetables, or cheese. Conversely, it can be heated in the oven or on the grill to cook fish, shrimp or thinly sliced meats. Will your friends be impressed with your skillful use of a Himalayan Salt Slab? I'm thinking yes; yes they will. Pete and Dave are also connecting and collaborating with other culinary locals like their next door neighbor The Blue Fish Restaurant and Oyster Bar, Twinn Bridges Farm, Bold Bean Coffee Roasters, and the North American Bee Hive Company. They plan to have in-store events with local chefs presenting demonstrations of their techniques, and explaining how they use salts, herbs and spices in their dishes. I asked Pete about his goals for The Green Man Gourmet. He said "I want everyone who comes to the shop to leave with a smile on their face. We want to be an attribute to the community. For us, it's something from the heart. We aren't just here to sell things to people, but to be a good neighbor and help educate and inspire. We would like our client base to grow, not just for us to prosper, but so we can increase the knowledge base in our community." There is no question that Pete and Dave are very good neighbors indeed. I encourage you to visit their website to peruse the shop or order online, and visit and 'like' their Facebook page to keep up with happenings, tastings and events. But to fully experience the delights of the shop, you really ought to go in person, find Pete or Dave, and ask them to share something interesting with you about salt. If you're lucky, they might tell you about this romantic and glamorous salt mine chapel in Poland! *The history of salt is an amazingly complex and fascinating story, which one could spend weeks, months, or even years exploring. For a great initial overview of the history and evolution of salt, along with a field guide to artisan salts, I recommend this resource. As you know from a past post, dear readers, there are few things I love more than bread. So imagine my delight when I happened upon a new bakery offering complimentary bread samples at our local farmer's market. After just one bite I was completely smitten. Dark, dense, aromatic and flavorful, it was like no other bread I had ever tasted. Naturally, I wanted to know everything about this bread and its baker. Meet Alex Roginsky-Podlyas, proprietor of Alex's Russian Bakery and baker of wonderful Russian rye breads. Born in the Ukraine, Alex came to the United States with his family when he was 14 years old. He always enjoyed cooking with his mother, and while in high school, he worked as an interim chef for a small Japanese restaurant in Milwaukee, Wisconsin. He graduated from the University of Wisconsin with a degree in Political Science and Law Studies. "I had no clue what I wanted to do when I 'grew up'," said Alex. "I knew I loved all things food, but I also knew that line of work was grossly underpaid. Serving up teriyaki skewers and tempura shrimp was not going to make me wealthy." So he set out to conquer the world of finance. He held various jobs in financial sales and retail banking, eventually moving to Jacksonville, Florida, to accept a position with a Wall Street bank. He was very successful - so much so that he traveled to India to train recent university graduates to work on the bank's systems. "I was the go-to guy for all of the 'important guys' in our Wall Street office and was the ace who either knew answers or could find answers to everything very quickly," he explained. But alas, one year when it came time for his annual performance review and potential bonus, he received surprisingly low marks. Alex was confused. "I thought I was being read another person's performance review," he said. Politics, favoritism or some other corporate wheels were evidently in motion and, as far as Alex was concerned, the writing was on the wall as it related to his future with the bank. His disillusionment with his financial position led him back to his first love - food. After considering his options, he decided to work with sourdough bread. "I thought my fellow Russian peers would love my bread," he said, "and given there are not many options for Russian bread in the United States, I thought my business would do well." Alex is focused on producing both sourdough rye and wheat breads, using only natural yeasts. He explained that sourdough breads do not necessarily have to be 'sour' (his breads are not) and likened the skill involved in managing the yeast in bread baking to that in beer brewing; the yeast is what gives flavor to both. The art is in creating the perfect balance. Perfecting that balance, however, was no simple task. "I must have had 200 trials and failures before my bread looked and tasted like the real thing; like it was made in a real, old-fashioned, countryside bakery in some obscure location in Latvia," he said. And although I have never been to a real, old-fashioned, countryside bakery in an obscure Latvian location, I would bet real serious money the bread there would taste just like Alex's. "I researched scientific journals of modern times for months to understand what Latvians figured out a few centuries ago without modern science - scalding flour with boiling water and 'sweetening' dough through a slow multi-step fermentation produces bread that is both nutritious and delicious (read more about it here). Modern science proves rye bread is the healthiest bread," he says. Healthy, and hearty - one (albeit very large) loaf can weigh almost 20 pounds! My favorite among the breads he produces is the dark and spicy Borodinsky, which is beyond delicious. Did you know that the village of Borodino was the site of a decisive battle between the Russian army and Napoleon in 1812? It's true! Legend has it that on the eve of the clash, the wife of a Russian general wanted to bake some special bread to fortify and encourage the soldiers. She seasoned the bread with coriander, a beloved local spice. 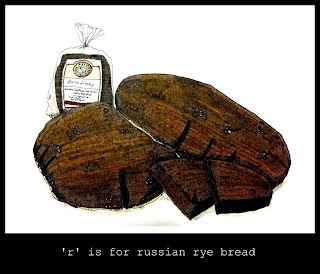 Napoleon subsequently lost thousands of troops in the battle, and Borodinsky acquired its heroic status among Russian breads. Officials at the Museum of Bread (yes, there is such a thing) in St. Petersburg dispute the relationship of Borodinsky and the Battle of Borodino, but...it's a good story nonetheless, no? Alex is passionate about producing a pure and authentic product. "I believe we've been living in an era of decreasing knowledge about bread and nutrition in general. My bread contains six ingredients or less. They are the most basic ingredients - water, flour, salt, roasted barley, sugar or molasses, spices. This is as fundamental as fire, wind, earth, water," he says. It seems that Alex has at long last found the real wealth he was seeking, and we are fortunate he has chosen to share it with us. You can find Alex most Saturdays at the Riverside Arts Market, and he has plans for a brick-and-mortar location on Edgewood Avenue in the heart of Murray Hill. Hooray! In the meantime, you can follow and support his delicious journey via his Facebook page. Quinoa - pronounced 'keen-wa' - is a member of the Goosefoot family, which includes plants like sugar beets, swiss chard, spinach, and the nomadic tumbleweed. 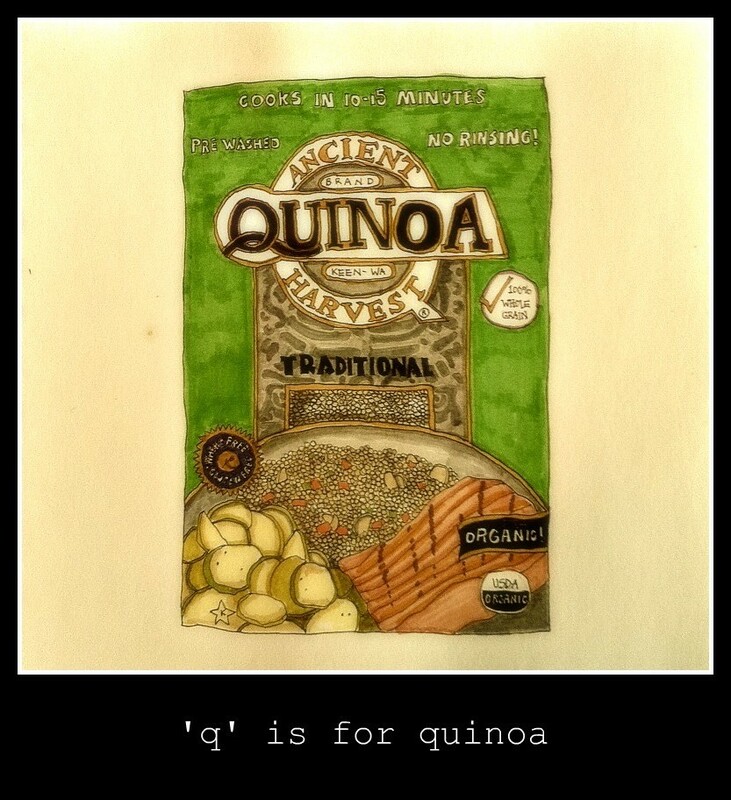 Quinoa has been cultivated high in the South American Andes for thousands of years. The ancient Incas considered it sacred and coined it 'the mother grain' because of its hardy nature and nutritional benefits. Unfortunately, the Spanish conquistadors were unkind to quinoa and its production was banned for many years because of its association with non-Christian ceremonies. 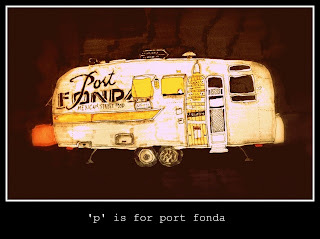 But it remained beloved by the Incas, and modern-day eaters are finding lots to love about it as well. You can read a detailed account of its history and the history of The Quinoa Corporation (makers of the fine product pictured above) here. Quinoa is not actually a grain, but a very small seed, which is wrapped around the middle by a thin band. The seeds are coated in naponin, a resiny substance that's very bitter and forms a soapy solution in water. The naponin must be removed from the quinoa before it is consumed. Most producers will have already done this for you, but some suggest a quick rinse before cooking. Quinoa is prepared in a manner similar to rice by combining it with water, bringing it to a boil, and allowing it to simmer until the water is absorbed. As the seed cooks and puffs, the band around its middle separates a bit, which provides the softly textured, slightly nutty taste of quinoa with an ever-so-delicate little crunch. Few foods pack the nutritional punch of quinoa, which is loaded with protein, fiber, vitamins and minerals. Quinoa is yummy in salads, casseroles, pilafs or stuffings, but my favorite way to prepare it was adapted from Heidi Swanson's recipe in her cookbook Super Natural Every Day, which is seriously one of the most wonderful cookbooks in the history of ever. Combine the quinoa, eggs, and salt in a medium bowl. Add the pepper flakes, chives, onions and garlic. Add the bread crumbs, stir and let the mixture sit for a minute or two to allow the crumbs to absorb some of the moisture. If you need more moisture, add a bit of water. If you need less, add a bit more bread crumbs, but it's better to err on the side of moist than dry. Your mixture is now ready to form into patties. I like them about 3 inches wide and 1 inch tall. Heat the oil in a large, heavy skillet over medium low heat. Add the patties, with enough breathing room around them. Cover and cook gently for 7-10 minutes until the bottoms are a crusty, deep golden brown. Carefully turn the patties over and cook, for an additional 7 minutes or until golden. I usually keep them covered for a bit, then uncover them during this phase. Sometimes the second side cooks quite a bit faster than the first side, so keep your eyes on them, or lower the heat a tad if necessary. When done, place on a wire rack to keep them crisp. Next, divide the arugula among plates - this recipe usually makes at least 2 patties each for 4 people - top with the patties, crumble liberal amounts of goat cheese over them, toss some chopped scallions about, and drizzle with your favorite vinaigrette. They are so delicious! This recipe is also great because you can make the mixture or the patties ahead of time and store in the fridge for a day or so. And now, for what may be one of the most arresting things you will ever witness as it relates to the preparation of this delectable little seed, I give you this two-part dose of awsomeness here and here. You're welcome. Copyright 2009-2013. Sweet. Bitter. Tart.